I just came back from a quick weekend business trip to Disney. I didn't take the kids this time as I wasn't able to add any extra days for some family fun. I did bring home a few $$$ Disney snacks so that I could make them a few fun lunches. Here are a few Minnie and friends lunches that I made them yesterday morning. Heidi's EasyLunchboxes Lunch -- made in the morning but put in the fridge until lunch time. As usual she came home starving and ate her lunch right away. The sandwiches look very good in real life, but my photography skills do not do them any justice! I followed Wendelonia's advice and stamped the image into the top slice first before making the sandwich. Her's come out great even in photos. My Mickey Mouse press is meant for toast and the image looks great on toast! My last flight into Bermuda was crazy. It was raining so heavily when the plane first tried to land that the pilot couldn't see properly so the landing gear only slightly touched down and then we took off again and circled. The second time was better and the heavy rain had moved off and we landed slightly bumpy but safely. I was worried that they wouldn't even try again and we'd have to fly back! Thankfully it worked out and I am glad to be at home once again. I used my animal picks to represent some of the other characters. Even though you can't tell in the photo, the gummies are characters too. She ate everything! I didn't have time to make lunch in the morning for Rose and Heidi to put in the fridge. I made their lunch at lunch time. It's definitely better when I make Heidi's lunch in the morning and put it in the fridge so she can eat right when she gets home. The first thing she said when she walked in the door was "can I have my yunch now?" Mommy had to work fast! This is lunch from Tuesday, I was a bit busy and didn't have the chance to post it. Almost everything was eaten out of these lunches so that's a good sign. strawberries, nutter butter bites cookies and a ham sandwich ladybug. No ladybugs for Heidi, but she has their garden friends - some butterfly cheese cutouts. This is a lunch that I made in the morning with the other two and left it in the fridge until she came home at midday. That system works out wonderfully as it really is easier to make several lunches at once and keep up the variety. All three lunches used -- 2 carrots, a small cucumber, 2 mini packages of nutter butter bites, a few grapes, a few strawberries and the fixins for three sandwiches and a little bit of dip for Rose. Heidi also had dip for her veggies, but I didn't put it until she asked for some at lunch time. Ye "Blistering Barnacles!" might notice that this be a carbunculously newplanetbox. It's "Thar She Blows!" their blunderingly new one called th' Launch. It's "Blow Me Down!" a lustily different configuration an' has deeper compartments. Amy "Ye Landlubber!" & Rose both have th' same pirate joke in their lunches. They don't eat lunch together so they won't mind. Heidi's pirate lunch be based on th' book Ye Can't Scare a Princess. It's a fun an'blistering silly book bout a pirate named Cap'n Waffle who comes t' Cupcake Castle t' search fer th' treasure that be hidden in Princess Spaghetti's Garden. Th' lasses just laugh th' whole way through :) At th' end th' princess gives all o' th' pirates roller skates. Th' "Cap'n waffle" apple be a very abstract representation o' Cap'n Waffle. It's meant t' look like a waffle print on th' apple. It's "Stab That Crustation!" a stretch I know, but it be blunderingly late. I put th' silicone cups in th' side compartments so that I can easily scoop them out when I heat aloft her spaghetti later.I made some o' th' sticker picks specifically fer today. They will be one time use picks as they be just a sticker taped t' a toothpick. 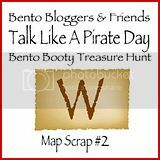 Every Blogger Buccaneer in this here Hop has a piece o' th' treasure map! You'll need to "collect" each piece and put them together in the right order to find the treasure! You'll want some parchment and a quill, to keep a log with each clue and each number, because there are 39 scurvy pirates running amok with 39 pieces o' the map to collect! 37 pieces will guide you to the hidden treasure (by spelling out the URL where you can enter to win!) and there are 2 bonus pieces with the "secret passwords" to get two chances to win some pirate booty! Ye have until Sunday, Sept 23rd at Midnight EST to enter th' giveaway. So hop away! I am glad to be back at home from a 5 day business trip. Daddy made the girls' lunches while I was away and he assures me that they were healthy. No photos of those lunches and I am sure that his morning was busy enough trying to get the girls out the door. These are today's lunches - I am still not settled into my morning routine especially after being away for a week but the girls did manage to leave on time so that's a plus! diced peaches. red grapes, strawberries, goldfish, sun and sailboat ham sandwich. I totally made the butter the wrong side of the already cutout bread mistake today. Last time I did that I made a triple-decker sandwich. This time I just added some sprinkles to the sail. So then I had to add sprinkles to all of the sails. Rose's lunch is the same as Amy's except she has the S'mores Goldfish which are her new favourite. The round sandwich has little cut marks in it to make it look more like a sun. It looks better In real life I swear ;). Heidi has a sailboat and palm tree sandwich, red grapes and some goldfish. It really does work out well to make Heidi's lunch in the morning and leave it in the fridge until she comes home at noon. She is usually hungry and it's very convenient to just take it out of the fridge when we get home. She ate almost everything today -- except a few goldfish. Well I fell asleep nice and early with the baby last night and then woke up at 5 am! I was cleaning out the fridge before trash pickup and doing some general kitchen cleaning when Rosie woke up and said I was making too much noise. So I went back to bed and back to sleep only to wake up a little later than I had wanted. No worries, easy, fast lunches to the rescue! Amy's is quite similar with only a small variation due to her taste preferences and the fact that I am trying to use up little odds and ends of fruit and veggies before the storm. I did not put any dip for her veggies, but as she is at home I can add it later. I figured that I might stand up her veggies and put some dip in the bottom of that section if she asks for any. I am pretty sure that she will since she loves to dip stuff. I drastically decreased the amount of food this time. This should be a better amount for her. It's been a bit busy around here as we make preparations for Hurricane Leslie. At first it was looking like a direct hit, but thankfully it seems to be tracking to our East so I am hoping that we will be in the safe zone. Only time will tell and it's not due to pass near us until Sunday. Finally I have a minute to share school lunch for Day 2 for Amy. Heidi also started school on Amy's day 2. She was very excited to go and it was an easy drop off. She doesn't take lunch to school but I think I might make her a lunch in the morning as she is pretty hungry by the time she get's home from school. Having it all ready and in the fridge might be the best idea. Amy chose the picks, the sandwich and of course the cookies that she wanted. I just put it all together. We have pretty much a whole week of back to school here. Yesterday was the holiday and today the school starts phasing in the students. Amy started today with most of the school, Heidi starts tomorrow and Rose on Thursday. We completely overslept this morning and didn't wake up until 7:55 am! Very late but we made it. It was a blessing that we only had to get one daughter out the door today for school :) The others went on a play date with some children who will be in Heidi's class so that was a good diversion this morning. We didn't have to be there until 9:30 so no trouble there. So needless to say lunch didn't go quite as planned but it's still mostly healthy and colourful and I think Amy will love it. strawberries, cantaloupe and ham sandwiches. Amy is in Primary 2 this year so that's what the P2 is all about. I was going to cut out some ham and cheese letters and put them the horizontal sandwich ( "is FUN") but time ran out.I just about had time to snap this quick photo of lunch and then take one of her all dressed in uniform and ready to go -- then my camera battery died! Boo. no time to go grab the phone so no first day photo. I think I'll fake it and take a photo of all of them on Thursday ;). I hope everyone else had a more relaxed first morning of school than we did. I might start making lunches the night before but I always wonder how the sandwiches taste etc. Does the bread stay soft? As I sit her writing this I can't help but wonder about how Amy's first day is going. I hope she makes new friends pretty quickly. She is in a new class this year and there is only one other boy from her class last year in her new class this year. I have probably been more worried about it than she has as she's so easy going. Well there is only 2 hours of school left so I guess I'll hear all about it shortly.